When I returned to New York in 1956, I lived and painted in a studio loft in Manhattan, but I felt like a total misfit in the art scene where Abstract Expressionism reigned. There was little tolerance for anything else. After a series of part-time teaching jobs at Jewish and Christian Y's and community centers, I had my first full-time job, art program director of the Grand Street Settlement House in the Lower East Side. It was a challenging juggling act to actively engage senior citizens, young children who arrived after school, and teenagers with art and craft projects. En route to work I sketched people, as well as chickens displayed in the windows of kosher butcher shops, their limp carcasses suspended from sharp hooks. I felt like them, trapped in New York. But that changed after I met SunBear (or Vincent LaDuke). SunBear arrived with a feather headdress and newspaper clippings publicizing his adventures en route from the Reno Sparks Indian Reservation where he had been living, to Washington, D.C. His goal was to raise public consciousness about reservation conditions and funds from legislators for better housing. I would soon learn about another America and relearn American history from a Native American perspective which had been omitted from my textbooks. SunBear and I left New York in a fifty dollar van we purchased from a New Jersey plumber for hauling my Mexico paintings and jazz records. Finally we reached Minnesota and the White Earth Reservation, where SunBear's mother, Judith LaDuke, welcomed us to her two-room cabin. She had raised six children there, and one room was almost entirely filled with an immense all-purpose wood stove. For six weeks I followed SunBear in the woods as he hunted and trapped deer, beaver, rabbits, and raccoon, and then skinned and cleaned each animal. I even shot a squirrel, high up in a tree, which became a delicious stew under Judith's guidance. My favorite meal was venison stew with wild rice that was harvested from nearby lakes. Living off the land was a full-time, tough existence, and I could not see devoting myself to this reality. We left for Los Angeles after the first early snowfall. There SunBear worked for Hollywood as a screen extra in stereotypical roles that included falling off horses. White men were portrayed as the noble heroes and righteous conquerors of Native Americans and their land. But SunBear's work was sporadic. My long-term survival strategy was based on enrolling at Los Angeles State College to complete an undergraduate degree, along with a Special Secondary teaching credential for art. I became pregnant and was glad, and I remained even more determined in my goals. Winona was born at the end of summer session at Los Angeles Community Hospital in 1959. Shortly after, Judith came to live with us for six months, followed by my mother who took leave from her pocketbook factory job and stayed with us for six weeks. I finally graduated and in 1961 began to teach art at Stevenson Junior High. I was good at motivating my Chicano students, as my Mexico experience enabled me to incorporate their cultural heritage in some of our art projects. Meanwhile I was working on my master's degree in printmaking at night and then summers at the Otis Art Institute. Weekends our social life frequently centered around regional powwows attended by uprooted Native Americans from many reservations. 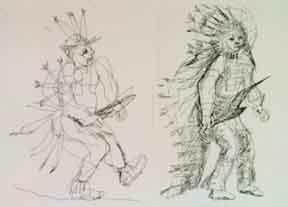 I danced with Winona in my arms and sometimes I even sketched The PowWow Dancers (fig. 9). We also went horseback riding with Winona sitting in SunBear's saddle before she could even walk. During holidays we visited reservations in the Northwest and West where SunBear tried to raise subscriptions for Many Smokes, an Indian newspaper he initiated and produced on a mimeograph machine. Winona had her third birthday on the Navaho reservation in Arizona. 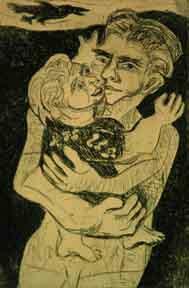 In my art, SunBear and Winona were the subjects of my first etchings (fig. 10). Then, in conjunction with college literature classes, I began to explore biblical and historical themes such as The Story of Moses, In the Beginning, and Los Marranos (fig. 11). Marranos was a derogatory term that referred to Jews who converted to Catholicism during the 15th century Spanish Inquisition. The alternative was torture and death. However, while accepting the exterior faÙade of Catholic rituals, the Marranos secretly maintained their Jewish beliefs. fig. 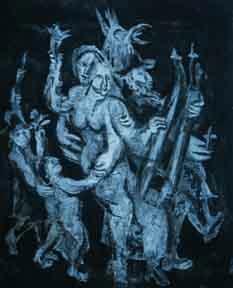 11: Los Marranos, 1961, etching, 18"x24"
In Mexico, Christ and the Virgin Mary had appeared as subjects of my painting, but this was the first time I began to explore my Jewish heritage. In addition I was gradually exposed to Northwest carved masks and totem poles, Hopi pottery, Navaho blankets, and Minnesota beadwork, and the people who produced them in relationship to their spiritual and physical needs. Rather than imitating superficial stylistic qualities, I focused on the content, the human drama as it evolved for me in my own figurative style. In Los Angeles I had begun to exhibit as Betty LaDuke, and that name would remain with me and our daughter, though Sun Bear and I had decided to part. Los Angeles had served as a six-year base for relationship, family, and community. Now our personal and professional needs evolved in directions that pulled us apart. Sun Bear would eventually establish a commune in Spokane, Washington. Winona and I moved to Ashland, Oregon, where we soon re-established our family and community. However, many years later after college graduation, Winona returned to live on the White Earth Reservation with a political and spiritual agenda, to reclaim her indigenous heritage for herself, her children, and future generations. All text and images © Betty LaDuke.